I really don’t want top get too political on here, but I did think this was an example of this art at it’s finest. I really don't want top get too political on here, but I did think this was an example of this art at it's finest. In what would be a quite remarkable brave new poster campaign to position Gordon Brown as the tough kid of politics, the UK Guardian today showed this new poster. If they have the nerve to run it, it will win them the General Election. I know it’s an April fool, but I still think it would be brilliant if they actually ran it! I wrote a few weeks ago about how much harm the David Cameron retouched posters had done for his reputation and subsequent chances of winning the UK General election, and this could be the perfect riposte by Labour. 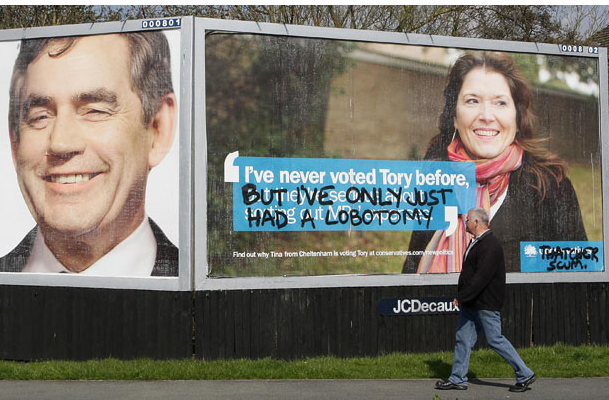 It has always been the Conservatives who have utilised the best Ad agencies and as such, the best work, but now Labour and Gordon Brown are playing them at their own game and actually winning. Have a read of this article in the Sunday Times about Saffron looking at rebranding Gordon Brown and New Labour. Ignoring the politics of it, Wally Olins makes a few points that we have been batting on about for for a few years now. 1. The more you advertise a bad product, the faster it will fail. 2. Changing a logo on its own will change nothing – other than the logo. 3. Branding itself needs rebranding – it has a bad name because there are too many people looking to just do (1) and (2) above without any thought to all the other stuff which is, perhaps even more important. We read Wally’s first book years ago and it is brilliant. I guess his second will be just as good too. I’ve just bought this myself, so will report back soon as to whether he adds anything new to the mix. We believe that David Milliband will be the next leader anyway!